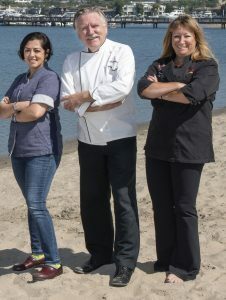 With so many “battle of the chefs” shows on TV these days, it’s not surprising that Orange County chefs would wage their own culinary battles for viewers. 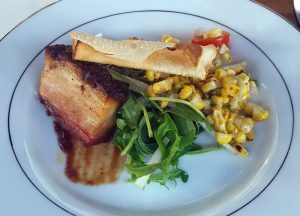 OC Chef Life has launched a monthly “Battle of the Chefs” contest held at the Fifth Rooftop Restaurant and Bar in Anaheim, across the street from Disneyland. It’s the only rooftop restaurant in Anaheim, and boasts terrific views of the area, plus the nightly Disneyland fireworks. 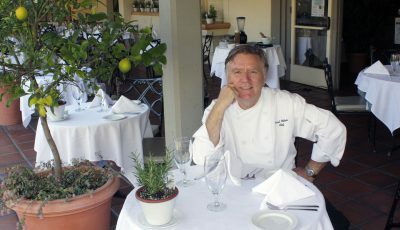 There were culinary fireworks last Tuesday evening when Chef Pascal Olhats of Café Jardin at Sherman Gardens in Corona del Mar and Pascal’s in San Juan Capistrano did battle with Chef Linda Johnson of Filomena’s Italian Kitchen on Newport Blvd. in Costa Mesa, with proceeds going to Family Justice Center Foundation. Christopher was asked to be one of the ‘expert commentators” for this battle and of course said yes. 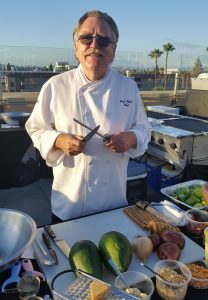 Two large cooking areas were set up on the rooftop, along with seating for nearly 100 guests who paid to watch the battle being videotaped for later airing on Chef Life TV. They also judged the food as they ate each chef’s dish. Chefs Pascal and Linda were assigned the theme of ‘street food,” and each created their own interpretations of that moniker. 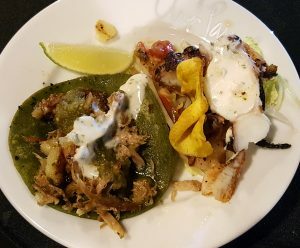 Chef Linda made a wrap loaded with everything from meat to spaghetti plus a side dish of scallops with a luscious red sauce, while Chef Pascal – who is an expert at French food – mixed Mexico and Thailand influences to create hybrid street tacos with such ingredients as duck confit (a French staple). 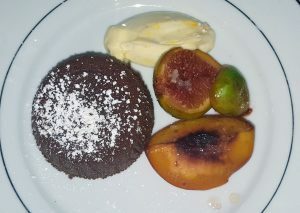 It was a close battle, with both sides having to plate 100 servings within one hour. After tasting both dishes, the audience voted for…Chef Pascal, who will go on to the semifinal round against Chef Zach Geerson of Citizen Kitchen. For more information on upcoming battles, visit OCChefLife.com. 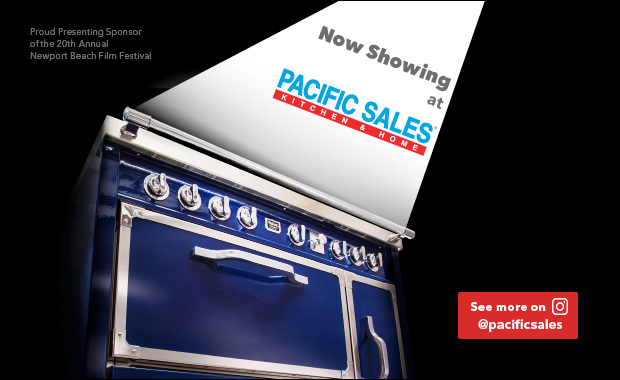 Chef Pascal and Chef Linda only have a few days to recover from their battle before their next culinary assignment: as featured chefs at the Pacific Wine and Food Classic, held at Newport Dunes this weekend. They’ll both be doing chef demos, and Chef Linda will be serving a trio of grilled fresh tomato bruschetta, roasted corn bruschetta and grilled peach bruschetta at her restaurant’s booth. Another noted chef, Shachi Mehra who has locations of her Indian restaurant Adya at University Center in Irvine and the Packing House in Anaheim, will be there with her restaurant crew serving her signature grilled corn chaat. We were invited to an “Indian Summer” dinner at her Anaheim location, and of course said yes so we could get a preview of her culinary talents. Chef Shachi and co-owner Sandeep Basrur showcased tandoor dishes as well as fresh curries and specialty items including her grilled corn chaat. In addition to eating this delicious Indian food, you can learn how to cook it at one of Chef Shachi’s cooking classes (only $35), held on the patio at the Anaheim location. For more information, visit AdyaOC.com. 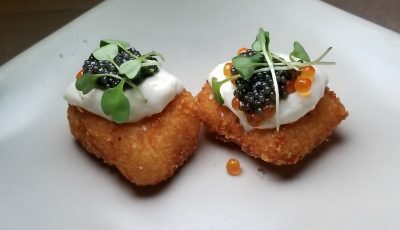 You can still get tickets to the Pacific Wine and Food Classic this weekend and see Chefs Pascal, Linda, Shachi and a host of others, plus savor food from 50 restaurants and sip wines from 50 wineries. 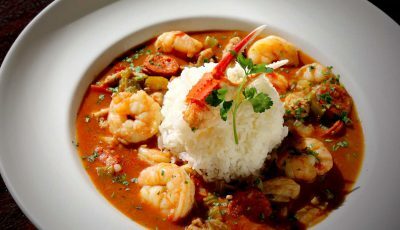 Chef Pascal will be sharing tips on making his famous Scampi Provencal Recipe on Saturday, while Chef Linda will show how to make her Salmon cheesecake appetizer on Sunday. 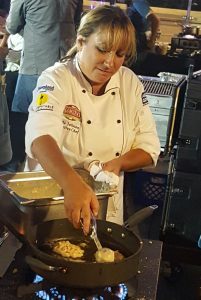 Other Newport-based chefs doing demos include Chef Jamie Gwen (Spanish Summer Gazpacho & Summer Fruit Soup), Chef Cathy Pavlos of Provenance (Grilled Peach and Heirloom Tomato Salad), Wing & Kelly Lam of Wahoo’s Fish Tacos (cajun shrimp tacos), and Chef Brian Huskey of Tackle Box (Beach Corn). The VIP and two-day tickets are sold out, but a handful of single day admissions are still available. 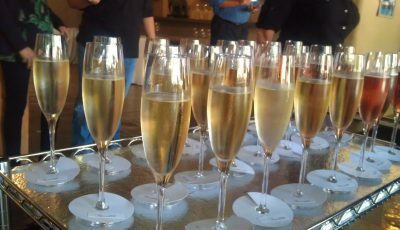 Visit pacificwineandfood.com for details.